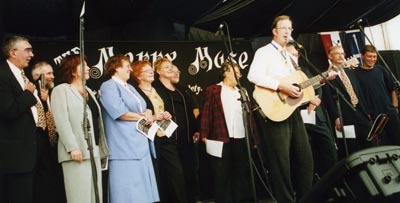 In the beginning there was an Audience (at the National Folk Festival 1998). And in the Audience were some public servants (also known as “shiny bums”), listening to the work songs of other occupations. And we said “Where are our singers? Where are our songs?” And so the Shiny Bum Singers were formed. At our debut at the National Folk Festival in 1999, you turned up in hundreds, and many more were turned away. By the second performance that evening we had achieved cult status, with another packed audience of great folk voices. Your massive choruses were the inspiration for this CD. All our performances since have been An Audience With the Shiny Bum Singers. 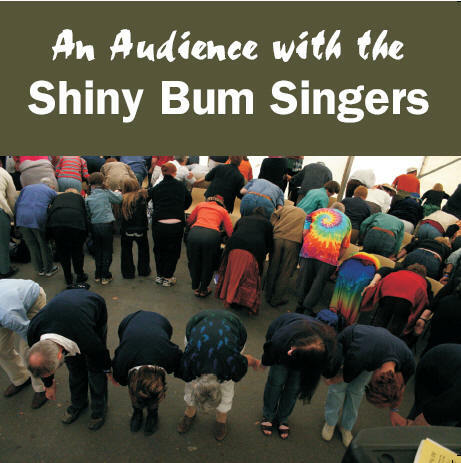 Our cover photograph shows us and our audience workshopping the Shiny Bum salute at the 2005 National Folk Festival. And you would not let us stop — 2006 is our eighth year. This first CD is of live performance tracks from the first five years, so that everyone, whether they were there or not, can share the atmosphere and audience response. This album is the sound of people enjoying themselves. And if you were at these performances, your voice is on this CD. 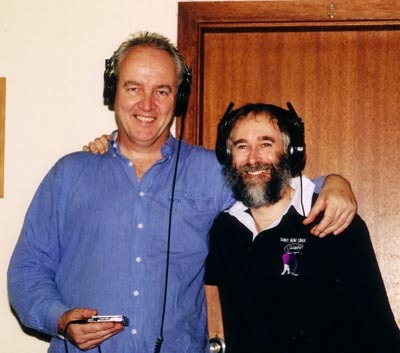 There are twenty four songs on the CD, with one (the lift shanty Farewell and Adieu) spread over four tracks. Here are two of the songs, with performance notes. This is a "lift shanty" with the verses for arrival at work, going to and returning from lunch, and going home split on this CD as it was in performance. We sang it packed into an invisible lift on stage. Are rites of the creed.